Today MVRDV unveiled plans for Baltyk Tower - a pixelated high-rise with a unique glass fiber and concrete louvered façade that controls daylight. Designed for a location on the western approach to Poznan, Poland, the gleaming building appears to change shape depending on the direction the viewer gazes from. The mixed-use tower will offer retail space, a hotel, and offices, and it will be an important addition to the city’s diverse and brightly-colored historic architecture. 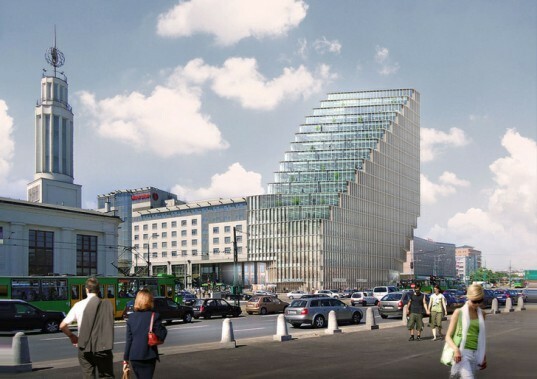 MVRDV‘s Baltyk Tower is slated to be completed in 2014 and the architects are shooting for a BREEAM Very Goodrating. The tower promises plentiful daylight for the office spaces by limiting their depth to seven meters. The glass curtain wall is protected from unwanted heat and glare by unique horizontal lovers made from glass fiber-embedded concrete slats. Suspended off the building, the louvers will filter light when the sun hits at an angle while reducing heat gain and glare — a bane for energy-efficient and comfortable working environments. The distinctive carved exterior continues MVRDV’s experimentation with stepped walls. The prominent building corner lurches over the street while the other side is stepped with generous patios on each floor — allowing occupants access to the world without having to leave. The building maximizes the use of its site – stating with three levels of underground parking. Retail will be placed on the lower floors, and the upper floors will hold a panorama restaurant, lots of shallow floor plates for office spaces, and a “one room hotel” (lost in translation?) The contemporary design boldly offsets the layers of architecture in the city, which range from bright and ornate 19th century buildings to the grey anonymous concrete blocks erected during the Soviet era. 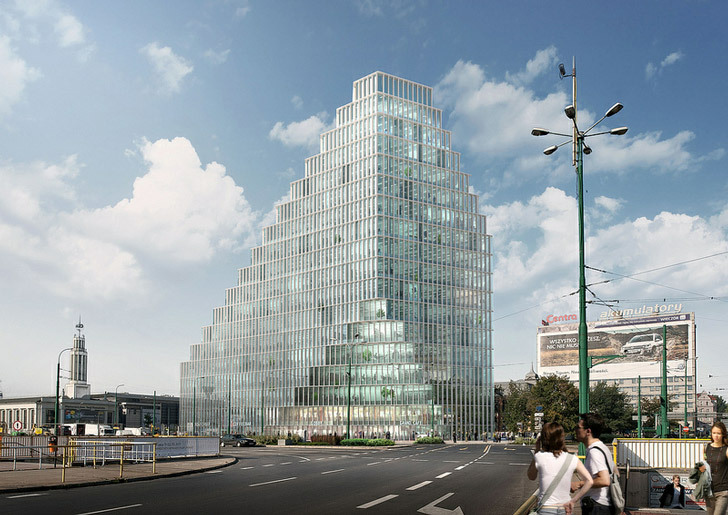 MVRDV's Baltyk Tower is slated to be completed in 2014 and the architects are shooting for a BREEAM Very Goodrating. The tower promises plentiful daylight for the office spaces by limiting their depth to seven meters. The glass curtain wall is protected from unwanted heat and glare by unique horizontal lovers made from glass fiber-embedded concrete slats. The distinctive carved exterior continues MVRDV’s experimentation with stepped walls. The prominent building corner lurches over the street. The other side is stepped with generous patios on each floor-- allowing occupants access to the world without having to leave. The contemporary design boldly offsets the layers of architecture in the city, which range from bright and ornate 19th century buildings to the grey anonymous concrete blocks erected during the Soviet era.